Severe accident heat removal system (SAHRS). The PCTRAN/EPR user interface is shown in the following mimic. As can be seen, the Combustible Gas Control System is at the lower-left corner. 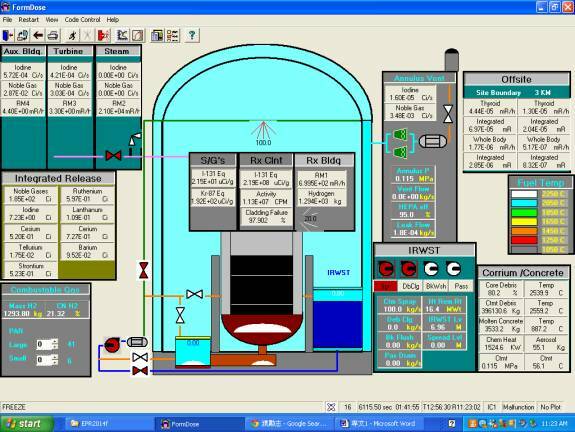 The instrument and controls of SARHS and IRWST are at both sides by the reactor vessels. The core debris catcher and spread area are below the vessel. The Annulus Ventilation System panel is right to the reactor building. The radiation monitors’ readings and release source terms of noble gases, iodine and molten-fuel heavy isotopes are displayed in each compartment. Active spray for containment atmosphere control. As shown in the above mimic, water is drawn from the IRWST and pumped through the heat exchanger and sprayed in the containment atmosphere to control its pressure rise. Active recirculation cooling of the molten core debris in the spread room. Should the core have melt through the vessel bottom and entered into the debris collector, it flows into the spread room. In the figure below, once operator clicks the “DbClg” button, the valve to the spread room is open. Water is directed into cooling the debris in the spread room. The containment building and shield building are separated by an annular space that is maintained at sub-atmospheric pressure by the Annulus Ventilation System (AVS). The AVS is a safety-related system used to filter any leakage through the primary containment, in the event of both design basis and severe accidents, prior to releasing it from the plant stack. The AVS ensures 2x100% extraction capability and consists of a high efficiency particulate air (HEPA) filters and charcoal absorbers in series with air handling equipment. When the system fans are turn on, the containment pressure and radioactivity will be reduced. The highly radioactive iodine will be vented through the HEPA filters that are rated to 99% efficiency. Nevertheless, a tradeoff of elevated noble gases or whole-body dose will be released into the atmosphere without any filtration effect. Therefore decision of activating this system should be prudent as a very last resort. 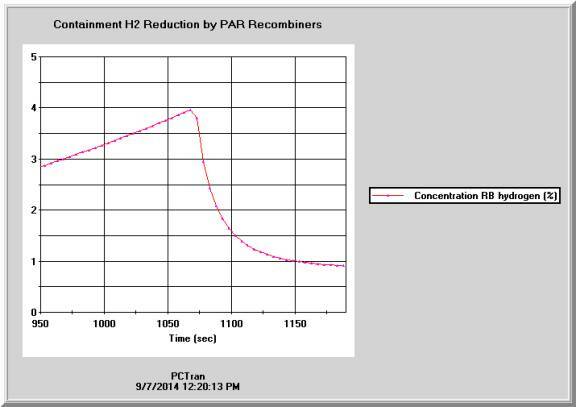 When hydrogen concentration in the containment is elevated to elevated level, operators may active a number of the PAR recombiners to reduce its concentration. In the transient figure below the concentration was increasing following a large break LOCA without ECCS with significant core damage and hydrogen in the containment. The operator turns on a number of recombiners, the concentration drops rapidly. PCTRAN as has all above systems and their respective functions modeled for dynamic simulation. As a result, students learn severe accidents in realistic and vivid hand-on exercise of the mitigation process. 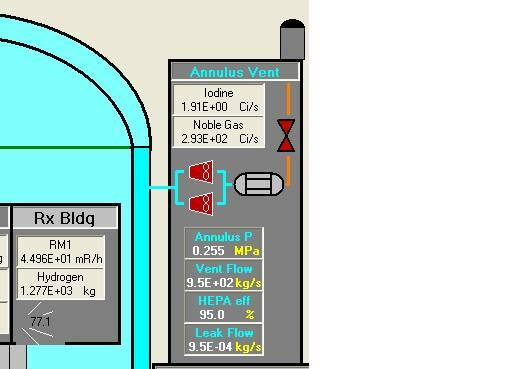 The original EPR illustrations of these systems are shown below for reference. The radiation monitors’ readings and release source terms of noble gases, iodine and heavy isotopes are displayed in each compartment. The data is saved and transportable to the software RadPuff for area dose projection.